Today, things have certainly changed for the charango. No longer is it a marginally-known instrument in the Peruvian Capital, nor in the large cities of America and Europe. Romantic and eloquent in the serenades of the Andean people, faithful companion to sing native melodies in the "chicherillas" (country bars) carrier of goodwill in the hands of the Cusco K'anas Indians, impetuous in Puno's K'aqello (folk dance), a part of Apurimac mythology; the charango is also a faithful companion to city-dwellers. It enchants and inspires pedestrians, Wayno (folk dancing) amateurs, rock fans, jazz musicians—even academic composers who have begun to compose very interesting pieces for the instrument. The various new uses of the charango have by no means damaged the local traditions, nor a loss of respect for the founding masters of the instrument. In fact, at the National Superior School of Folklore, there are more and more young charanguists, from children to teens, who study the works of the old masters, and little by little learn from them. We know next to nothing about the origins of the charango. However, we do know that previously validated accounts that its characteristic appearance was born from the intention to mock of the European guitar, and that its small dimensions are the fruit of a strategy making it possible to hide it Spanish authorities are only legends. Empirical scientific evidence, supported by many researchers, suggests that it is improbable that the charango would have been born from the deformation of the European guitar. To the surprise of many skeptics, the standard model of the charango, echoing the design of Spanish guitar, is constantly evolving, resulting in a great diversity of charangos. Peru's most popular charangos resemble tiny guitars, but there are also those with soundboards made of plastic, fruit bark, animal horn, tin-cans, tortoise shell; in circular form, trapezoidal, triangular, in the shape of siren, concave or in the shape of an armadillo shell, and sometimes even made with an actual armadillo shell (in this case the charango is called a "quirquincho"). Some play the instrument with a pick, like the "Huancavelica", others simply play with the fingers. Charangos often are strung with "gut" strings, or metal or nylon with the strings strung doubled or tripled, with the third, second, fifth, or octaves. There are also five-string instruments. Like its European ancestors, the charango is "multiple", and it is that which gives it such richness. It can be played solo or accompanied by guitars, and provides a very important sonority to Andean folk ensembles. Its versatility allows the interpretation of all genres of music, from "Yaravi" (romantic, and sad), carnival music, "Waynos" (traditional dances), even the "wasichaky", a traditional "roof-raising" dance. There are actually several resources relating to the charango in which one may find substantial interesting historical information about the charango, including beautiful legends, myths, local traditions, information about charangists, etc… These works are of immense historical significance, and clearly portray the cultural importance the charango acquired, and how the diverse cultures of the Andes, and scientists see it and have developped it. 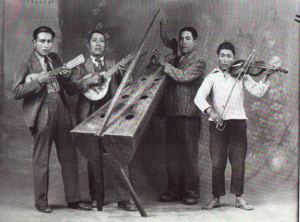 In this manner, the charango was introduced into cosmopolitan world, facing new challenges in Peru, acquiring new dimensions abroad (like in the European malls Ecuadorian Otavaleños (inhabitants of Otavalo succeeded in introducing it into their traditional music, as well as the new popular groups of Chile). In this process of globalization, the charango, like it always has, inspires and embraces the influence of the myriad of the world's other instruments and cultures.